The Big Cave (Megalo Spilaio) Monasterym is built in front of a massive cave entrance, on an almost sheer,120m cliff face. Take in the landscapes from the train window or in an adrenaline-pumping trek across narrow bridges and dark tunnels. 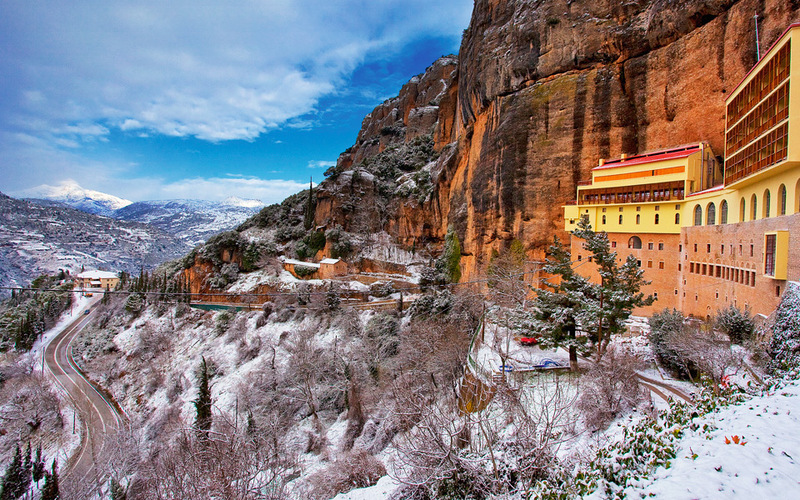 Kalavryta is one of the few places in Greece where you can enjoy a view from the mighty mountaintops over a gorge as beautiful as Vouraikos, without having to risk life and limb clinging to a climbing rope. And this is thanks to the rack railway, a small train on cogs that sets off from the seaside town of Diakofto in the northern Peloponnese, makes a stop at the verdant village of Kato Zachlorou and at the impressive Mega Spilaio (Big Cave) monastery, to end an hour later, 22k further along the track and 700m up in the historical town of Kalavryta. Make sure to get your tickets a day or two beforehand – this excursion is a favorite with weekenders and families – put a new memory card in your camera and, if you enjoy outdoor adventures, pack a backpack of snacks and drinks, and put on your hiking boots, because the best way to enjoy the area’s natural beauty is to ascend by train and descend on foot. The trail back down the mountain is not sign-posted but it is part of the E4 European Trails Network. With a little care in railway tunnels and on narrow bridges – no accidents have ever been recorded and the train drivers always give a good long toot of the horn at the trickier spots – the descent should take roughly 6 hours. The construction of the rack railway a century ago was no easy feat. The 22k route required six tunnels of a total of 200m to be dug through the rock and 49 bridges to be erected, nine of which are arched and made of stone. As the train leaves the terminus at Diakofto (160k from Athens), the low brush and the calm waters of the Gulf of Corinth give no indication of the wild beauty that you will soon encounter. Leaving behind farms and olive groves, the walls of the gorge start to get narrower, almost impassable. The electric-powered train makes its way through tunnels bored into the rock and dark underpasses, clings to narrow bridges and, most importantly, crawls its way up steep inclines thanks to the tooth-like cogs of the middle rail that keeps the train in place along the more precipitous parts of the route. The railway’s construction in the early 19th century was considered a feat of advanced engineering and made possible thanks to the valuable knowledge of the French and Italian workers who had built similar systems in the Alps. 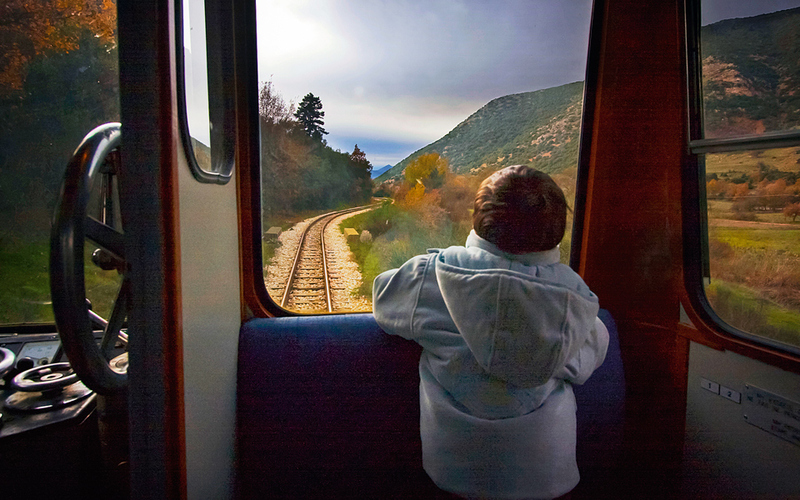 Up until 1960, it was the chief mode of transport for the locals and contributed significantly to economic growth in the area, once completely isolated in the mountain masses of Achaia. The train that once served the local economy by transporting people and goods is now used almost exclusively as a tourist attraction. Nature has also done more than its part to enhance the journey, offering passengers spectacular rock formations, waterfalls and imposing cliffs. You will pass by nature’s court, Dikastiria, a cave with stalagmites and stalactites that looks like a courtroom, complete with judge and the accused. The most famous and photographed spot on the rote is Portes, a stretch that got its name from the huge metallic gates at the entrance to the old tunnel. These used to open and close so that locals would have to pay a toll fee to cross. Today they are always left open and it is definitely worth taking a few snapshots of the narrowest pass in the Vouraikos Gorge, a spectacle which, according to legend, was formed when Heracles cut through the rock with his sword so he could pass with the Erymanthian Boar under his arm and deliver it to Eurystheus to complete his fourth labor. Shortly after you will come to the picturesque village of Kato Zachlorou, which has a few small café-tavernas that transport you to a time when there were no roads in the area and the train was the only means of transportation. Pilgrims wanting to reach the Mega Spilaio Monastery would have to make the climb on donkeys, while the tavern-hotel Romanzo has been the setting for several Greek bucolic films, most notably “The Shepherdess’s Sweetheart,” today the absolute cult film of Greek cinema history. You can take snaps outside the picturesque Mega Spilaio station, enjoy a coffee or a meal beside the tracks, walk along the iron bridge that passes above the gorge or take the trail on the left of the station (marked with blue triangles) and make your way on foot for about 2 kilometers to the monastery. 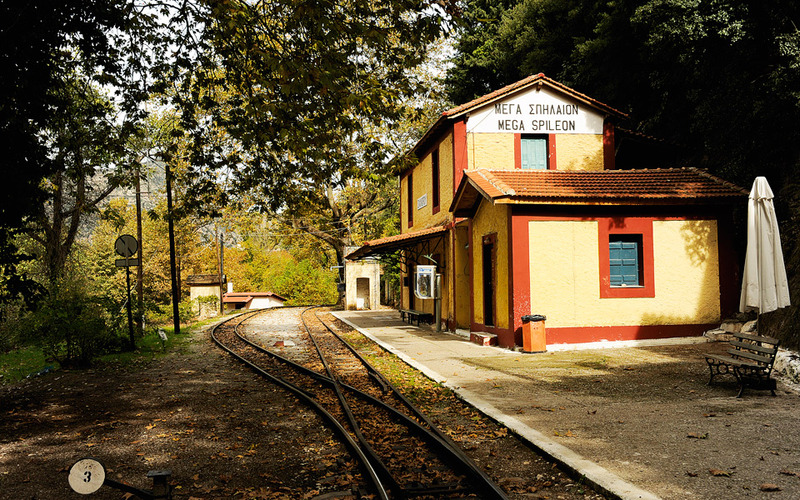 The Mega Spilaio/Kato Zachlorou train station is the intermediary stop of the rack railway train that sets off from Diakofto and ends up at Kalavryta. The train then continues along a stretch flanked with plane trees, weeping willows and ferns which leads out of the gorge as you reach Kerpini. 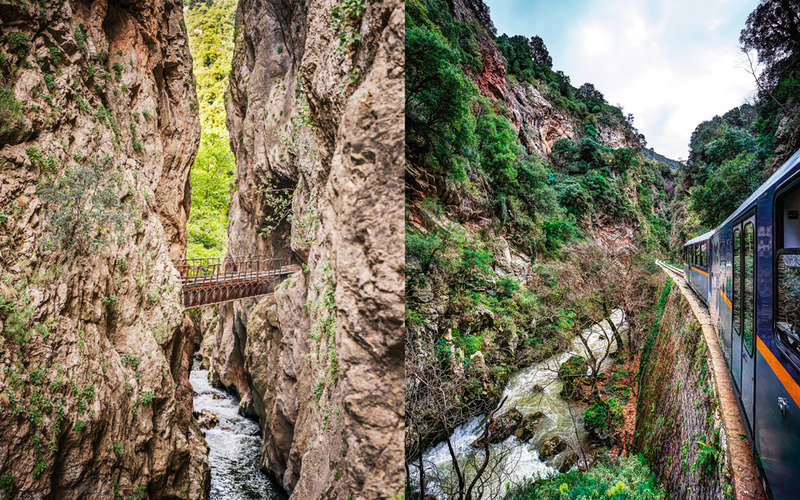 The wildness of the gorge is now well behind you but the route remains very pretty indeed, all the way to the final destination, Kalavryta. The small town on the slope of Mount Helmos has lost none of its traditional charm and becomes even more colorful as skiers make their base here, roaming around in their striking gear during the winter months. It is also a very popular weekend vacation spot, inundated on public holidays especially by travelers who want to explore its lovely landscapes and pay tribute to its history. Known in antiquity as Cynathea, the town was practically razed to the ground by Aetolian conquerors in 220 BC, a fate that was also to befall modern-day Kalavryta, a name given to the area possibly due to the abundance of natural springs (kala meaning good and vryta meaning springs). On December 13, 1943, Nazi occupiers put the town to the torch and massacred its entire male population in retaliation for the capture and execution of 78 German soldiers by Greek resistance fighters. Known today as the Kalavryta Massacre, it was the biggest atrocity committed in Greece during World War II. The clock on the left-hand bell tower of the metropolitan cathedral in the main square remains stopped since that day in silent tribute to the victims.